All screws will have loctite applied and torque to proper specs. Scope alignment to bore. Aligning the scope to the bore keeps the scope internals closer to the center of the scope. The scope adjustments should be left to fine tuning the sighting in. We offer everything you need to get your rifle set up for the next season, either hunting, varmints, or targets. Aligned and bored scope rings. Where the color is silver that is the high spot on the rings. That is what makes contact with the scope. When clamped the scope will be bent. Internals will be shook loose. Nitrogen will leak out and the scope will fill with moisture. Ask about our remote services. We can receive your new rifle from your supplier, set it up, clean it up, sight it in, ship it to you ready to go. We do mail order repairs. Remington 700, Thumbhole Walnut stock, Leupold scope, rings and bases. Timney Trigger. 28" Ted Gaillard barrel. 300 RUM factory 180 gr Chrono'd @ 3318 fps. That leaves over 2300 ft/lbs energy at 500 yds. 5 shot groups are covered by a looney. For a wide range of choices we have many contacts for different finishes, from Gun-Kote to water transfer ink coating. These two stocks were done by our friends at Cobra Imaging. Long Range Hunter. Remington 700, Wildcat Thumbhole Laminate stock, 7mm Rem Mag, long heavy custom barrel from Ted Gaillard, premium scope mounting system from Farrell & Leupold. Tikka T3. Poor groups and shifting zero issues. Notice front scope base on left picture. Base was not square. On the right, different screws, Torx head, larger head, will help hold the base centered above the screw holes, which hold the base square and prevents it from shifting. Scope rings will be bored and aligned. Same Tikka T3. Scope alignment tool installed with laser bore sight tools in bore & alignment tool. On the left: Not only can you see the laser dots out of alignment, you can see the tool not even eyeballed to the bore. On the right: Physically lined up, scope rings to the rifle bore. Before with 0.75" out at 3 feet, that's 75" or over 6 feet out at 100 yds. Not much of a wonder this rifle was tough to zero. 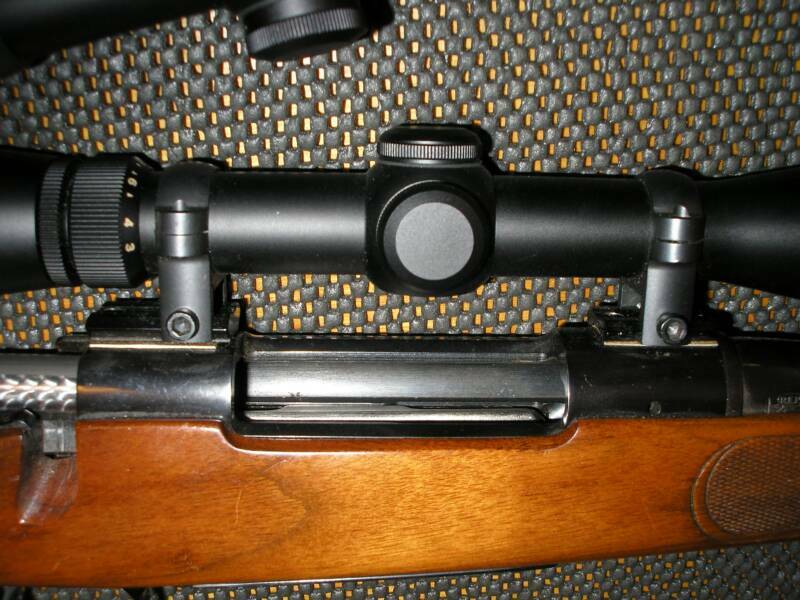 The closer the scope rings are aligned with the bore, the less internal adjustments will be required on the scope. The scope works better when the internals are closer to center. Want accuracy for long range shooting? The above is a 1 piece Farrell Industries base 20 MOA with Leupold PRW rings. Very sturdy system. Fairly economical especially compared to some Tactical systems. This 20 MOA base is designed for 700+ yd's shots. We are a Farrell authorized dealer, but this is my no means the only system we have available. Let us work with you to customize your scope mounting system to suit your application. This Tikka came to us shooting 4" groups. Now it shoots a little better. Less than 1" @ 100 yds from a 300 Win Mag. Put your personal touch on an older firearm. Good looking, good feeling high performance laminate stock. Pillar bedded, free floated barrel. Still light weight and functional. Especially in harsh wet weather. Yes, it will still fit in your saddle scabbard, or over your shoulder. Nice balance, sub moa rifle. While some applications may give us no choice as to using shims, you won't find cardboard shims coming out of our shop. Steel or stainless steel shims are what we use. This is pretty typical of what we get in for rifles with a shifting zero. On the left you can see how far out the original ring alignment is. That scope is under fierce torque. Couple that torque with the shaking an vibration of repeated shooting, it is just a matter of time befor something fails. On the right, scope rings aligned. Do you have a quality Leupold scope? Are you shooting farther than you did before? Are you considering getting a new scope with one of the bullet drop compensators? Most of the major scope manufacturers make them. Not sure if you want to lay out that much $ for a new scope? Not sure how one type of reticle will work for your favorite load? Consider upgrading your current Leupold scope with a custom elevation turrent. These are calibrated to your specific load and hunting condition. For a fraction of the cost of a new scope. We at Hillbilly Arms are not affiliated with Leupold, Korth or Leupold Canada. But we have dealt with them and find their work timely, capable, professional and dependable. Check out Korth Group right here in sunny southern Alberta. Check out the Custom Shop on their website. You can deal with them directly, or we can take your scope off, send it in for you, set it up and sight it in for you. The Ruger on the left was slated to get a new barrel and scope put on it. It wasn't shooting all that good. The scope was checked out by the professionals at Korth Group, the Leupold Canada Dealer, then had a custom BDC Dial installed calibrated for his specific load, then the rifle received our Set Up Package. Now this Ruger is shooting less than 1/4 moa for fraction of the cost of a new barrel and new scope. New Winchester M70 30/06 sight in target. Fiberglass re-inforcing stocks is done to add strength. We router in steel re-inforcements to further strengthen your stock. Ever had that front swivel screw pull through on you? Had your rifle crash down on the rocks. Even the best scope and the best scope warranty won't stand up to a 8 pound rifle falling on the scope on the frozen rocks. They always land on the scope, just like falling toast always lands jam down. It's a Murphy Law thing. We can put a nut backed front swivel screw in your stock for you. Mens & Womens T-Shirts available while supplies last. Email code is case sensitive. Designed for the prone hunter. Ideal for shooting off sand bags and bipods. Engineered for 50% recoil reduction. Slim profile. Muzzle blast does not blow down disrupting snow and ground debris. Prevents debris from blowing back on the shooter and optics. Controls muzzle jump so sight picture is maintained. Great to see the effects of the shot. Good for varmint and large caliber rifles. Stainless Steel and Blued available. Engineerd for 50% recoil reduction. Slim profile, quiet, controls muzzle jump. Stainless Steel and Blued available.